Project managers usually have busy days juggling multiple projects and teams as well as monitoring their scope, budget and schedule to make sure they are on track. If their time is not managed efficiently, they can easily fall behind and let things slip through the cracks. A project manager’s time is important. It’s easy to become overwhelmed if you don’t have some set processes in place to help you get through your day. Of course, one of the biggest characteristics of a good project manager is being organized. Part of that organization is achievable through the use of tools that can help streamline workload, increase efficiency and help with productivity. Below are a few of our favorite project management tools that help keep our days balanced and controlled. 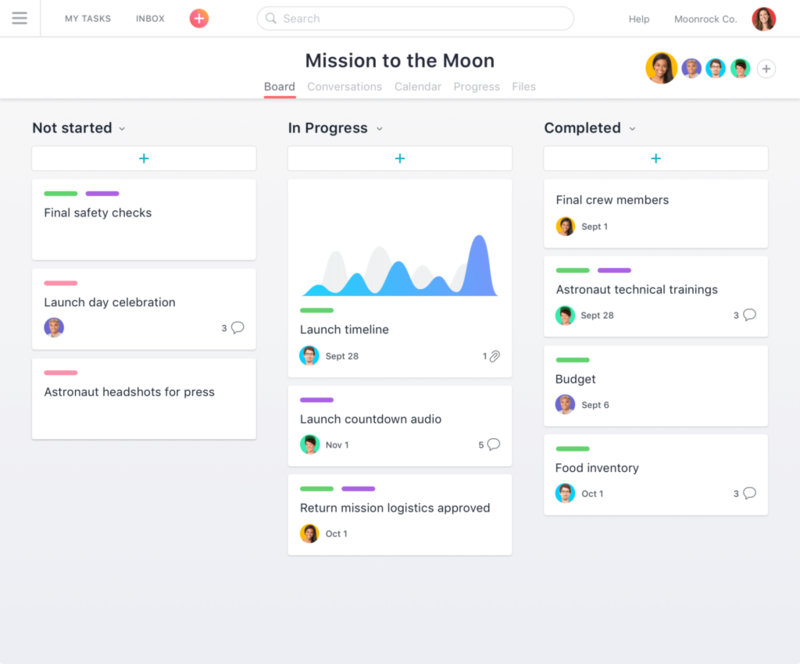 Asana is a project management software that has a free tier for small teams to use with many great features. Its features for project management include the ability to create projects and assign tasks to them. These tasks can be prioritized, assigned to a team member and a due date can be set. You can also upload files related to a task such as images, documents and more. The user has the ability to add sub-tasks under main tasks as well. 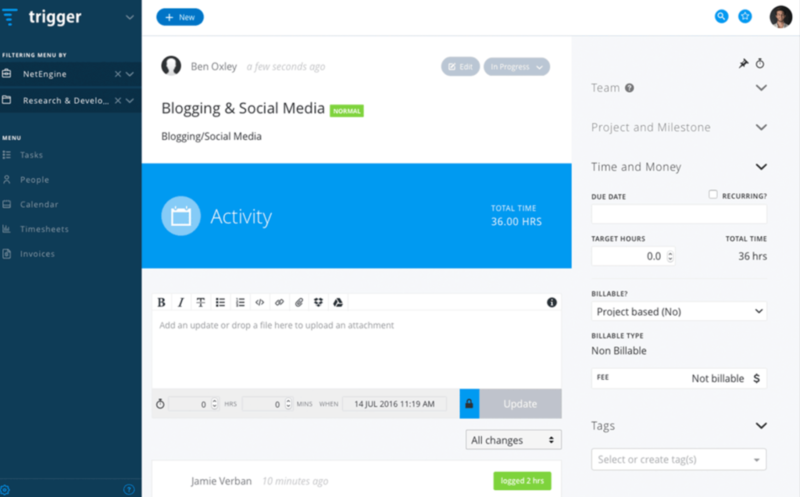 Asana has sections and dashboards that you can setup based on your workflow. It can also be setup for agile project management. It has calendar views and conversations so team members can speak about a project or task within the platform based on the work they are doing. The app is available for download on multiple devices. Trello is a great way for teams to collaborate and manage projects. The software uses boards that contain lists that could be public or private for certain team members. Any number of users can be added to a Trello board. The lists on a Trello board contain cards. These cards can be viewed as tickets in a support system that need to be reviewed and worked on. When a card is opened, a user will have the ability to add descriptions, comments, due dates, upload files, and more. Based on the progress of these cards, they will then be moved through the lists until they are completed. Freedcamp helps teams stay organized and offers many features for project managers to make their job easier. With freedcamp, users have the ability to create task lists and subtasks that can be managed on Kanban boards by dragging them across columns until they are complete. Team members also have the ability to create private task lists. Other features of freedcamp include a calendar view that shows an overview of due items, discussions, a wall for team members to communicate with each other within the system, milestones, issue tracker and time for billing clients and tracking productivity. The app can also be downloaded on various devices. Toggl is a free time tracking software that is used to help with productivity. The setup is simple and the tool is easy to use. You can connect the timer to many web tools via the software browser extensions that make tracking time anywhere on the web possible. 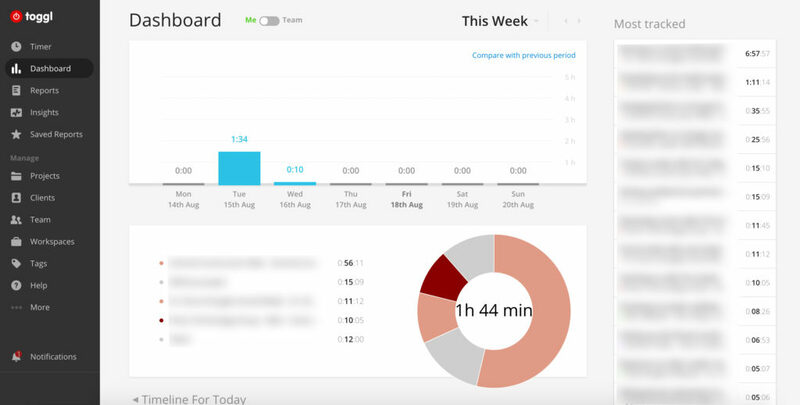 Inside of Toggl, a user has the ability to create projects and tasks, assign them to clients and log time under these to be able to categorize their time spent. At the end, a user will be able to generate reports to see where their time went on certain projects. The reporting is a great feature when it comes to budgeting and invoicing clients. Trigger is a time tracking and management tool that makes keeping track of projects, analyzing insights and invoicing clients easy. Features include setting up projects, tasks, tracking budgets and expenses, invoicing and time tracking. The time tracking feature is built-in and very simple to use. Team members can log their time against their tasks manually or in real-time. 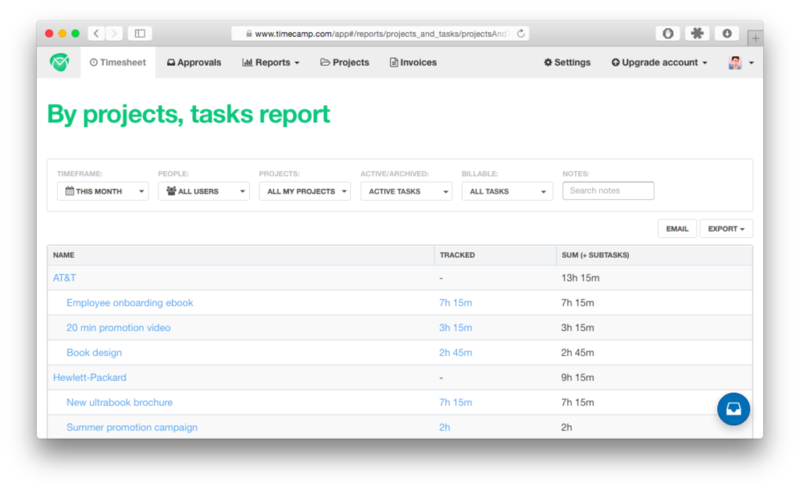 Project managers will be able to see how much time is being logged on projects and tasks, which can help with reporting. TimeCamp is a time tracking tool that makes managing billable hours easier. Project managers have the ability to measure a project’s budget to determine if they are profiting or losing money. Timesheets can be generated to give a snapshot view of where hours are being spent on projects and tasks. Other features of the software include one-click time tracking, automatic time tracking, estimates vs. actuals, reporting and more. 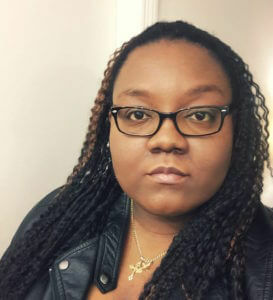 TimeCamp helps users keep track of their productivity by monitoring unproductive activities and how much time they spend on them vs. the productive ones. The software can be downloaded on various devices. Sometimes, team members may not all be in the same location, but they may be working on the same project. While methods such as email and phone are good ways to stay in touch, there are more immediate, real-time methods that teams can use for open communication and collaboration throughout the day. Slack is a great communication and collaboration tool that has taken the concept of instant messaging and pushed it a step further. 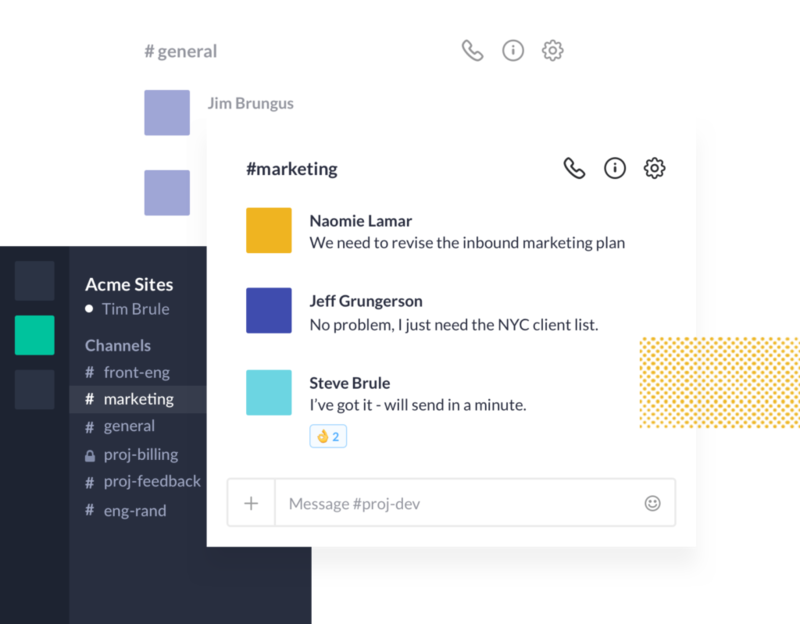 Features include channels that organize team conversations, slack calls and app integrations to other popular software platforms. Users can also upload and share files with each other making it a one-stop app for teams to stay in contact with each other and get work done. We like Google Hangouts because it is an easy and effective way to host virtual meetings with team members who may not all be present at the same location. To participate, a team member will need a working microphone and camera, which comes built into most mobile devices such as laptops, tablets, and smartphones. Google Hangouts also has a screen sharing feature, which is useful when giving presentations to a team or referencing something that comes up in the discussion. There is a chat feature where users can send messages or share links. There is also the ability to make outgoing calls to other phone lines so persons who do not have Google Hangouts can still participate in the meetings. HipChat is a chat software by Atlassian who are also the creators of Jira, Confluence and other software products. 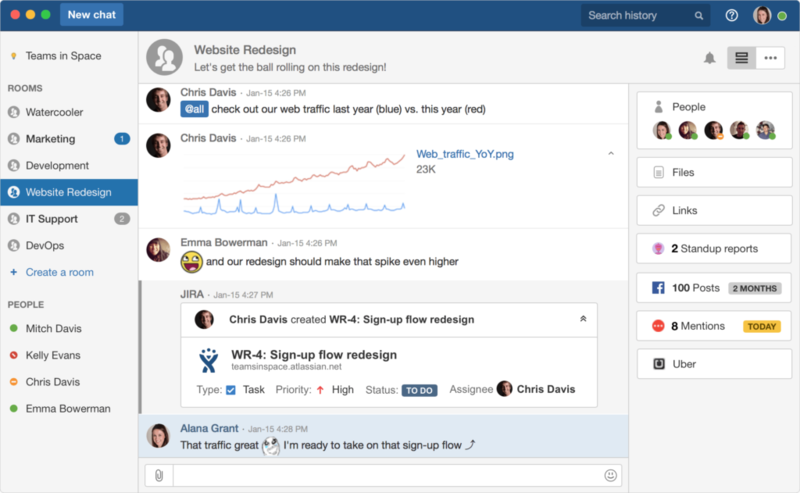 HipChat was built for business to allow teams to communicate with each other and keep up to date on their projects and tasks. Some of the features of HipChat include screens sharing, group chat, chat search and history as well as video chat. Team members can share files and links between themselves. The software also comes with security features that keep conversations and materials being shared secure. HipChat offers integration with other software and the app is available for download on desktop, tablet and mobile devices. 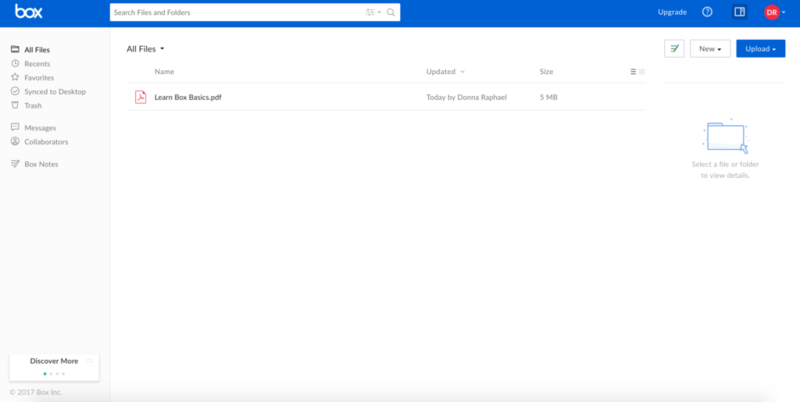 Dropbox is one of the more popular file storage tools available for individuals and teams to organize their files by uploading, downloading, syncing, categorizing and sharing files easily through the cloud. It supports a multitude of file formats and integrates with many other software products, making it flexible to use. The desktop and mobile app make syncing files easier. Other features of Dropbox include previews of files and videos, the ability to edit documents and save them inside of Dropbox, file recovery and more. The free version of Dropbox starts a user with 2 GB of space with the option to upgrade to other plans for more space. Google Drive is free to setup and use. It’s part of the Google products that a user has access to with a Google account. In the free version, a user will get 15 GB of free storage to use between Google Drive, Gmail and Google Photos. Google Drive is similar to Dropbox where users can upload different file formats, sync Google Drive to their devices, organize their files through folders and share files with other users. It also has file previews and generates attached thumbnails in Gmail when you share a file in a Gmail message. The free version of Box offers 10 GB of storage with a 250 MB file upload limit. The software makes file sharing a lot easier. Some of the features include the ability to share files via a link or email from Box, organization through grouping files in folders, preview of files without needing to download them first, and the ability to sync files easily with the app on your device. Box is great for collaboration between teams, security, content management and more. Wunderlist helps keep your day organized and managed with to-do checklists. The free version of the app has many features that can be used. With Wunderlist you have the ability to create folders that can help categorize your list of to-dos. On all to-dos that are created, a user will have the ability to add comments, notes, due dates, recurring dates, and reminders. Another great feature of Wunderlist is the ability to use hashtags in to-dos and the ability to print to-do lists. It is also available to download on various devices. 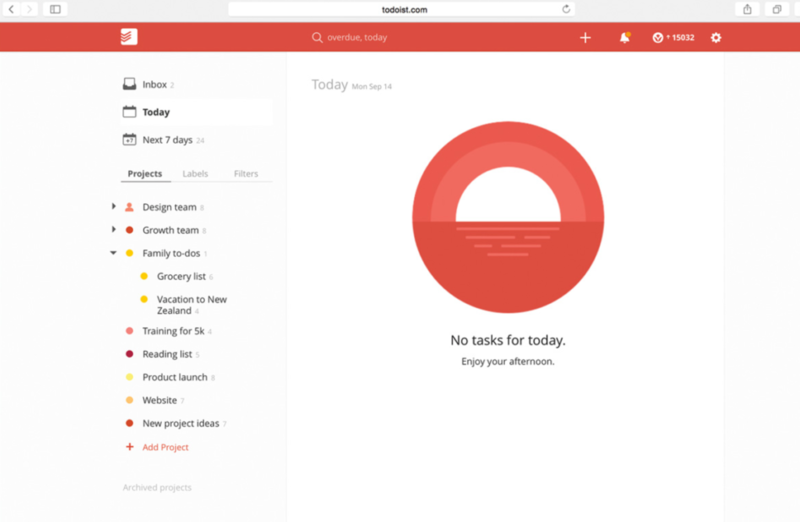 Todoist helps users manage tasks and projects online and offline across 10+ platforms. Features of todoist include the ability to create sub-tasks, receive notifications, create sub-projects, real-time data syncing, adding recurring dates for tasks, setting color-coded priorities and more. Users can collaborate on tasks that are shared to reach their goal together. The app is also available for download on multiple devices. Any.do helps get a user’s life under control with its easy to use application that offers a to-do list, calendar, and assistant that can take care of tasks for the user. With the to-do list, a user can create tasks, lists, and reminders based on time and location for them to get things done. They can also share the tasks with others and add comments to the tasks to keep on track. Other features of the app include a calendar view that can help the user plan their time as well as integration with Google Calendar, Exchange, iCloud and more. Any.do has a smart suggest and voice feature that a user can use to capture tasks. The app is also available for download on multiple devices. As you can see, there are a plethora of tools on the web that can be used to help with your productivity goals. At the end of the day, the tools you select will be based on preference and need. 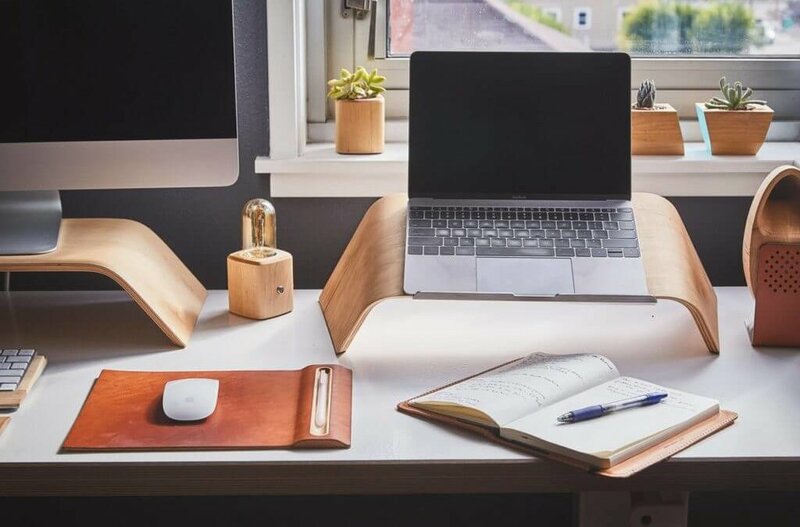 However, we hope that this list of project management tools will be a good starting guide to help get your days, weeks and months planned and managed.